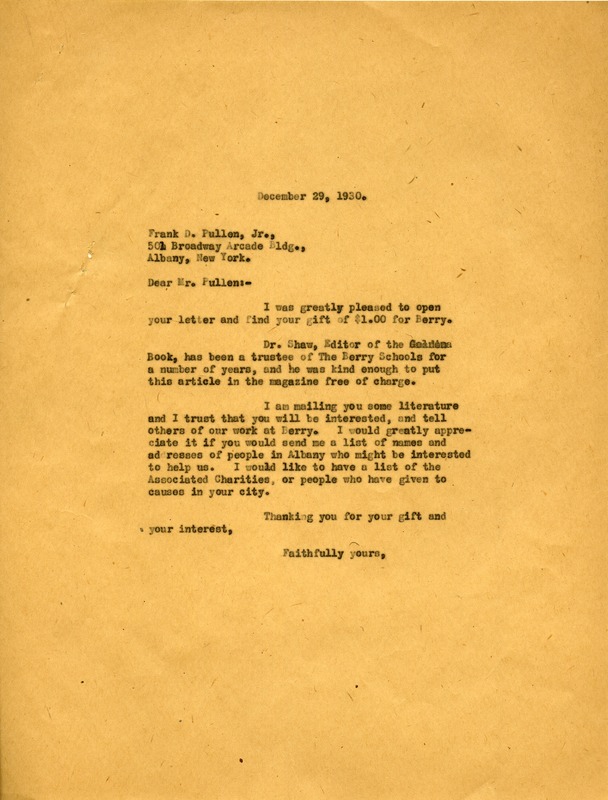 Martha Berry Digital Archive | Letter from Martha Berry to Frank Pullen Jr.
Letter from Martha Berry to Frank Pullen Jr.
A letter thanking Mr. Pullen for his donation of $1.00 and also asking for a list of all the people in Albany who might be interested in Berry. Martha Berry, “Letter from Martha Berry to Frank Pullen Jr..” Martha Berry Digital Archive. Eds. Schlitz, Stephanie A., Jordan Brannen, Cameron Atwood, Meg Ratliff, et al. Mount Berry: Berry College, 2014. accessed April 24, 2019, https://mbda.berry.edu/items/show/13768.